This article is about a level in Donkey Kong Country 2: Diddy's Kong Quest. For the level in Donkey Kong Land 2, see Hothead Hop. 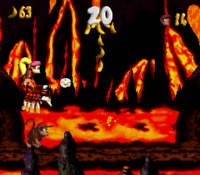 Hot-Head Hop is the sixth level of Donkey Kong Country 2: Diddy's Kong Quest. It is the first area of Crocodile Cauldron. 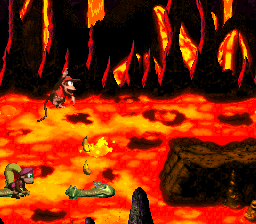 This level takes place inside of a volcano, and the Kongs must use Krockheads as stepping stones in order to cross rivers of lava inside of it. This level also marks Squitter the Spider's first appearance, who proves himself useful by helping Diddy and Dixie Kong reach and complete Bonus Levels and grab the level's DK Coin. The spider also assists them by defeating enemies in their way and creating web platforms to cross pits. Klampons make their debut here as well. Other enemies include Neeks, Klobbers, Zingers and Krunchas. The Kongs begin the level outside of a tunnel with a dark treasure chest, which contains a green Extra Life Balloon, on it. Another treasure chest is ahead of the tunnel that contains the letter K. After the heroes pass a Neek and a Klobber, they come up to a pit of lava with a few Krockheads in it, whom they can use as platform to cross. Once they reach the other side of the pit, they come up to a solid area of ground with a raised piece of land in the center of it. A DK Barrel sits in front of the raised platform, which a Klampon walks along. At the end of this area, the primates can find a Klobber and then a pit with three Krockheads in it. The last of the Krockheads can bounce the heroes high into the air so they can reach another solid piece of land with a treasure chest and a Klobber on it. Inside the treasure chest, they can find a Banana Coin, or, in the Game Boy Advance version of the game, a Golden Feather or a Banana Bunch. 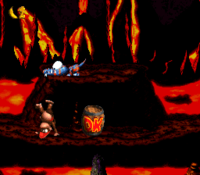 Two more Krockheads stick their heads out of a lava-filled pit ahead of here, and both of them fling the Kongs into the air when jumped on. They can send the heroes onto a high platform shooting out of the lava. A wider pit of lava containing four Krockheads is ahead of here, and once it is crossed, the primates reach an area with a DK Barrel and a raised piece of land with two Klampons around it. One of the Klampons is in front of the raised piece of ground, and it guards a treasure chest with a kannonball in it. An additional Klampon marches on the raised platform, which the letter O floats above. The duo can find a lava pit ahead of here that they can cross with two Krockheads that fling them into the air when landed on. A small platform that holds a Klampon is on the other side of the pit, which is followed by an additional pit containing two more Krockheads that can fling them into the air. Another small platform is after this pit, and it holds another Klampon. There is a larger platform near here that supports a kannon and a Klobber. If the Kongs make their way to a pit east from here, they can find two Krockheads in it that can fling them to a nearby Star Barrel positioned high in the air. After the primates cross this pit, they can find a DK Barrel and an Animal Crate containing Squitter ahead of them. Next to the crate, the heroes can find a formation of bananas that form the letter Y (or the letter B in the game's remake). Some Neeks march along the path ahead of here, and after they are passed, the group reaches another formation of bananas that create the letter A (or the letter R in the Game Boy Advance remake). A Banana Coin floats above the letter A, which is followed by a small pit with a single Krockhead in it. The letter N floats above this pit, and once it is crossed, the primates make their way up a few steep ledges with Klampons on them to reach the top of a large structure. At the top of this structure, they can find a trail of bananas leading them towards a pit the contains two Krockheads and a Zinger that flies between the two reptiles. The Krockheads can fling them over the Zinger and across the rest of the abyss, where they can find a flat pathway with a Klobber on it. In the Game Boy Advance version of the game, this Klobber is in possession of a photograph. Once the heroes make it to the end of the flat pathway, they reach a pit of lava with two Krockheads in it and a single Zinger flying over it. The Krockheads, who are able to fling the Kongs in the air, can help them cross the pit, which is followed by a platform with a Kruncha on it and the letter G above it. A group of bananas and Banana Bunches are also above the letter G. The primates can find a long pit ahead of here; they can either cross it with a pair of Auto Fire Barrels, or with Squitter's web platforms. If they use the spider to help them cross, they find a few Zingers in their path on the way. However, they can find many bananas and some Banana Coins in the area between the Zingers. Once the group crosses the pit, they reach an area of land with two Klampons on it. A Bonus Barrel is in view above these foes, who are followed by a No Animal Sign that makes Squitter disappear if he comes up to it (there are actually two, with an invisible one being underneath the real one in an attempt to block players from using Squitter's web platforms to crawl underneath the sign). If the Animal Buddy is successfully led to the sign, the Kongs are also awarded with a red Extra Life Balloon. They can find a small pit of lava ahead of here with a Krockhead in it, who can bounce them onto a nearby End of Level Target located on the opposite side of the pit. If they hit the target, they complete the level. Additionally, if they land on the target from the nearby Krockhead, they are given a prize, such as a Banana Coin, as the exit. K: If the primates break open a treasure chest located at the beginning of the level, they can find the letter K.
O: Immediately after the heroes pass the second DK Barrel, they can find a raised piece of land with a Klampon on it. The letter O is above this piece of land. N: The letter N is located above the first pit form Squitter's Animal Crate. G: Near the end of the level, the Kongs can find the letter G high above a Kruncha, who marches near a large pit that can be crossed with some Auto Fire Barrels. The level's DK Coin is located directly above Squitter's crate. When the Kongs get the spider, they must use his webs to climb upwards to th coin, which is surrounded by many bananas. At the beginning of the level, the Kongs should use their Team-up move to throw one another on top of the nearby tunnel that they begin the stage next to. If they use their Team-up move again on this tunnel, they can reach a hidden Warp Barrel that leads them to a Bonus Level, which contains a No Animal Sign and a group of bananas that form an exclamation mark. Once they exit the Bonus Level through the tunnel to the right of the area, they land in the main level on the final Krockhead in the level, who is located immediately before the End of Level Target. After passing the second set of Knocheads, the Kongs can find a treasure chest on the ground. If they throw it at an enemy, such as the nearby Klobber, it breaks open, revealing a Golden Feather. After they collect it once, the feather is replaced by a Banana Bunch in later playthroughs of the course. In the area found shortly after the letter N, the heroes can find a Klobber with a camera icon above its head. If they defeat this foe, they are given a photograph of a Klobber for the first page of their scrapbook. Immediately after the second DK Barrel in the level, Diddy and Dixie can find a place with two Klampons and a raised piece of land. There are a few treasure chests in this area. If they break open the chest in front of the raised piece of land, a kannonball is revealed that they must carry ahead with them. After they take the kannonball across a few pits with Krockheads and along a few small platforms with Klampons on them, they come up to a solid platform with a kannon on it. If they load up the kannon with the kannonball and then walk inside of it, they are blasted into a Bonus Level, where they must jump off of several Krockheads in a pit to collect 60 stars placed high in the air. If all of the stars are obtained within 20 seconds, a Kremkoin appears to grab within the remaining time. Shortly after the letter N, the Kongs should find two bananas placed right next to each other immediately after a pit containing Krockheads. Using the Squitter's web abilities, they must climb up to these bananas with some web platforms to find more bananas in the air. If they make their way towards these bananas, a Bonus Barrel is put into view. It leads to a Bonus Level, where the animals can find bananas in the formation of an arrow pointing straight up. They must follow this arrow by using Squitter's special webs to climb up in that direction. The Kremkoin is at the top of the area for them to grab within 20 seconds. Immediately before Squitter's No Animal Sign, a couple of Klampons can be found with a Bonus Barrel above them. The barrel can be reached either with the primates' Team-up move, or with Squitter's web abilities. The special barrel leads to a Bonus Level, where they must use Squtter's special web-creating ability to cross a pit within the time limit of 20 seconds. If Squitter is not with the Kongs when they first enter the bonus, they can find him at the beginning of the Bonus Level. 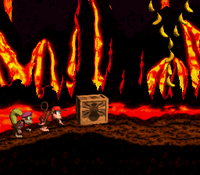 Once the primates cross the pit, they can find a Kremkoin that they must grab with the remaining time to win the Bonus Level. This page was last edited on April 6, 2019, at 01:51.